This is how our practical session starts each day. 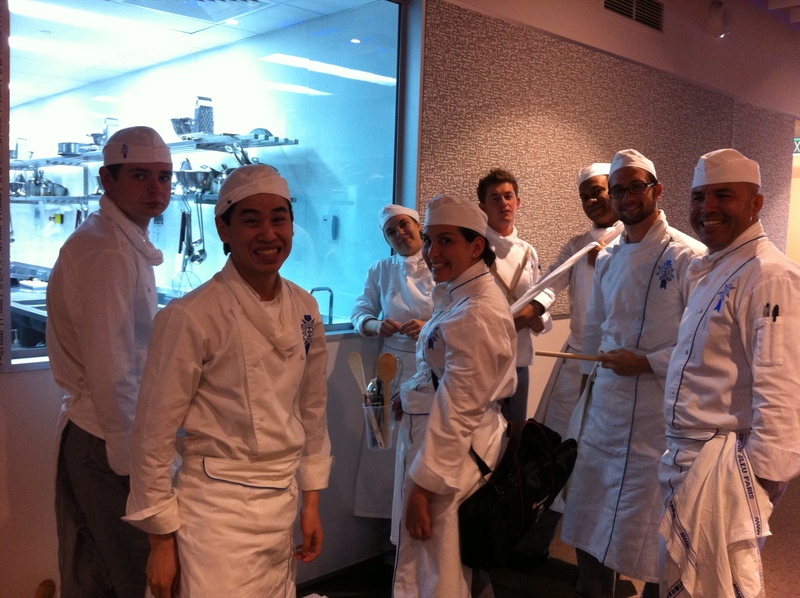 Those who aren’t setting out the ingredients and equipment wait anxiously outside the kitchen peering in the window to see what the goodies look like. 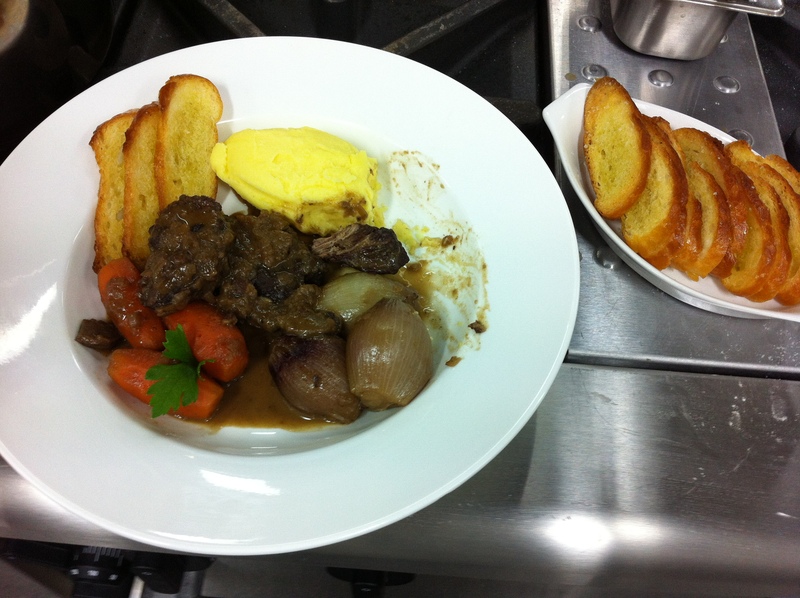 Lesson 17 is the French favourite Boeuf Bourguignon, plus we’re making puff pastry for tarts for lesson 18. Within a couple of minutes of the doors opening, there’s a buzz of activity. The beef is going to take at least one hour thirty to cook and we’ve got to dice the meat, sear it until it’s dark brown and caramelized, cut the bacon into lardons, peel garlic, slice onions, quarter mushrooms, make a bouquet garni, soak the cepes (mushrooms) and on and on. Oh and the potatoes have to go in the oven to bake because we need them for the pomme puree. At the same time we are working through the various stages of the puff pastry. And the carrots need turning too. So while the pastry dough or detrempe is resting we switch back and forwards between tasks. Days like today illustrate the importance of accurate work plans. The shallots need to come out so they don’t over cook. The carrots need to go in so that they are cooked. We’re also serving sourdough croutons which are straight forward – thin slices, rubbed with garlic and brushed with olive oil but oh so easy to over cook and burn. 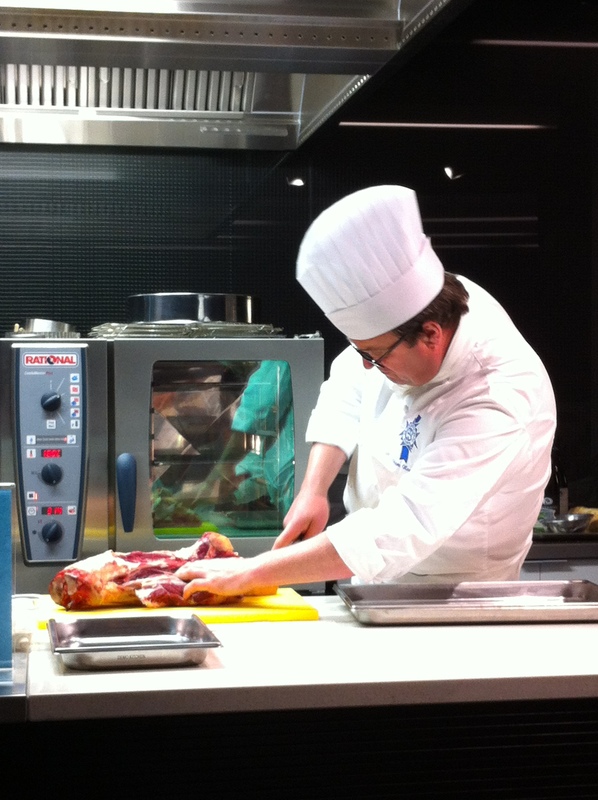 We all want to produce a Bourguignon that equals the intense richness of the one Chef made for us. 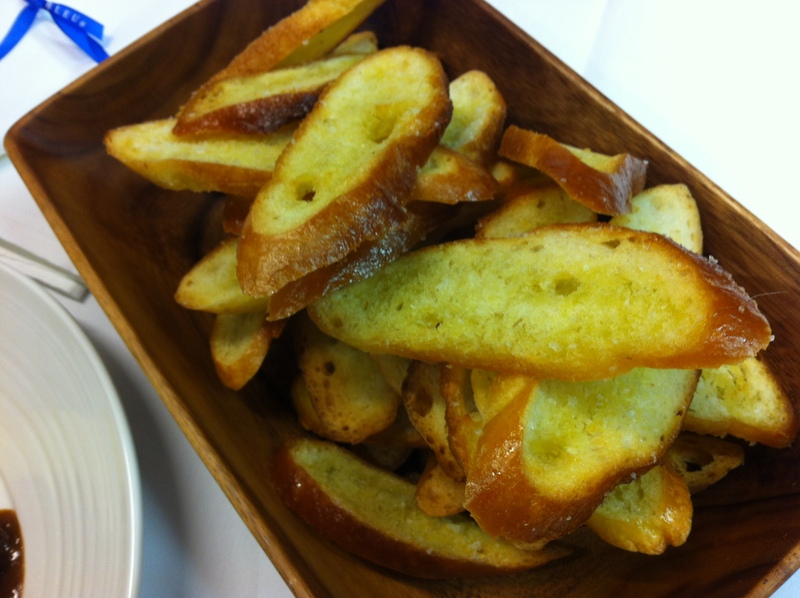 We all want our croutons crisp and golden brown with a hint of garlic and the gloss of the olive oil. And we all want our mash to be silky smooth and buttery. And as for the pastry, we want to make sure the huge chunk of butter stays firmly encased in the dough and that we get all the rolling and folding done without it getting too warm. Exhausted? – absolutely. Satisfied? – completely. The day is done and I’m already thinking about lesson 18 and turning that pastry into thin tarts of scallops and leeks to serve with a saffron and caper vinaigrette. Glorious! Such a classic, and doing it under that kind of pressure makes it something else again. Great photos too Heather, thank you! Wow, I still get hungry every time I see the photos and read the detailed descriptions. It all looks so amazing Heather – would love to be a fly on the wall and watch over your classes. Sounds like a lot less hassle and more exciting that the Julia Childs way. Hope it was yummy.